Dezeen will be busy in New York during the second half of this month's citywide design festival, as we co-host a variety of events with companies including Tom Dixon, WeWork and Vitra. New York's annual celebration of design is stretching across almost the entire month of May this year, bookended by the Collective Design fair and the International Contemporary Furniture Fair (ICFF). This week and next, a cohort from Dezeen's London office will join our team in New York to help cover the myriad of launches and exhibitions taking place around the city, and bring you the highlights. We're involved in a series of events across the fortnight, including a talk with WeWork and Hem, and parties with Tom Dixon and Vitra. Dezeen is also media partner for the WantedDesign trade shows in Brooklyn and Manhattan, and together we'll be putting on a public closing party for NYCxDesign. Dezeen founder and editor-in-chief Marcus Fairs will host a panel discussion with design brand Hem founder and CEO Petrus Palmér, co-working company WeWork's head of interior design Brittney Hart, and London-based designer Philippe Malouin. The participants will discuss the future of the workplace, and how design needs to change in the digital age as nomad working becomes the norm. The talk begins at 7pm and will be followed by cocktails until 9:30pm. The event is strictly invitation only, but Dezeen will be live streaming the talk on our Facebook page and publishing the video on our site. Dezeen is teaming up with British designer Tom Dixon and his neighbours on Howard Street in SoHo to throw an evening party. Many of the area's retailers will offer drinks, late opening hours and special offers on products, while local radio station 8 Ball will be providing music via Sonos speakers. 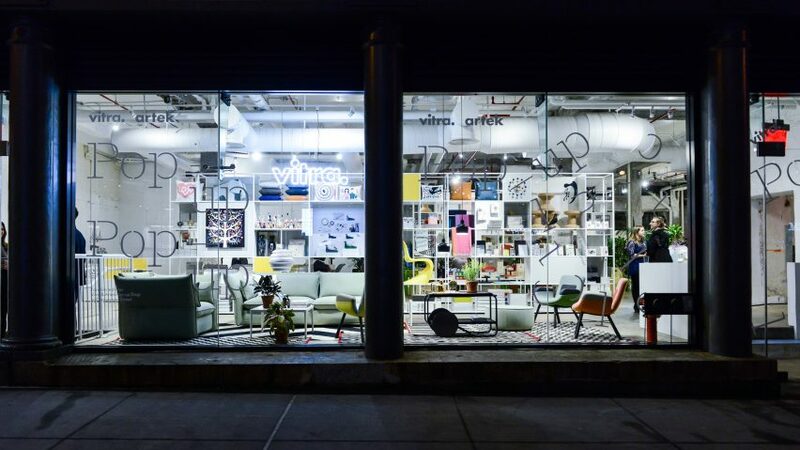 We'll be co-hosting an exclusive party at Vitra's pop-up store in the Meatpacking district, where the design brand will be showcasing textiles by Hella Jongerius and Raf Simons, as well as rugs by Nanimarquina. Drinks and light bites will be served. Dezeen and WantedDesign are putting an exclusive party at the Seaport Design District to mark the close of this year's NYCxDesign. The outdoor event is open to all and will include music, drinks and shopping opportunities.